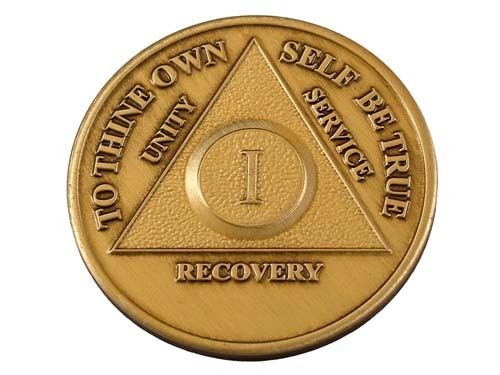 The bronze anniversary medallion has been the traditional commemorative gift for milestones in sobriety for years. A Roman numeral designates the total number of years of sobriety. These beautiful bronze medallions feature a unique raised center and are a universally recognized creation for celebrating achievement and commitment. Each exquisitely minted antiqued bronze medallion will last a life time! Treasure these special chips for years or pass them along to the next deserving recovering alcoholic! 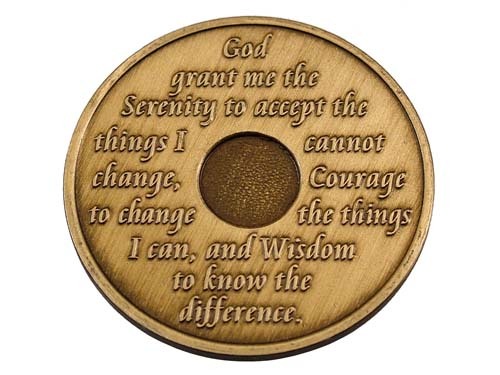 The Serenity Prayer is beautifully displayed on the reverse side of each bronze medallion. Read a bit more about the History of A.A. Medallions. Always in stock and immediately shipped. WoodenUrecover.com is one of the very few places I have found that always has plenty of chips in stock and consistently ships them in record time! I am so glad I met you at the 2015 International Convention in Atlanta. You are my home group's new and only source for anniversary chips! I gave my best friend her 28 year medallion on Saturday as I do every year and she was so happy. I have been ordering from Wooden U Recovery for years and they are always there for me with their great products and service! There is no one else I ever consider ordering from! You guys rock!